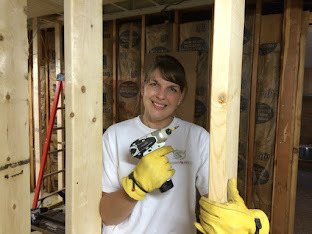 We are actually nearing the end of our basement renovation and I have recently revealed the finished bathroom, but I am taking a step back for a moment. 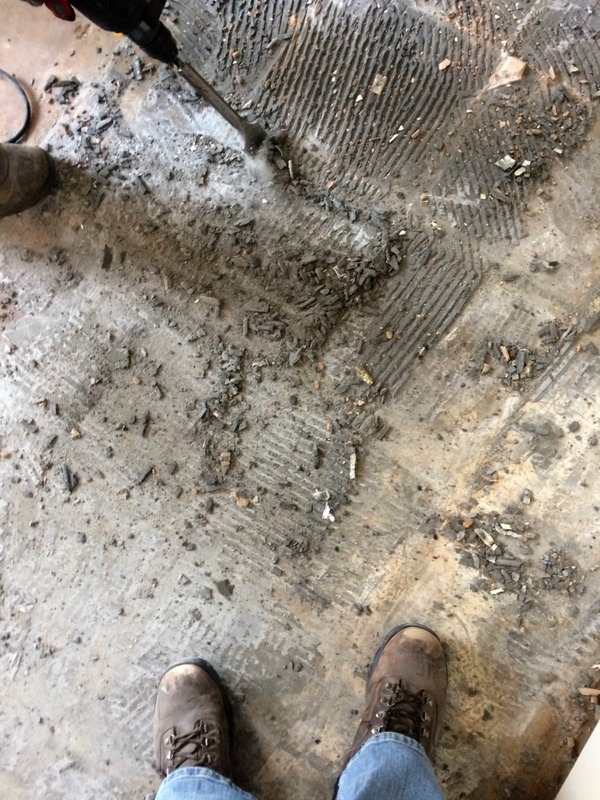 I was looking through my pictures on my phone and ran across the ones I took during our tile removal in the mud room and realized I had not shared this project yet. That is what happens when you have way too many projects going on and are trying to document and share them all. 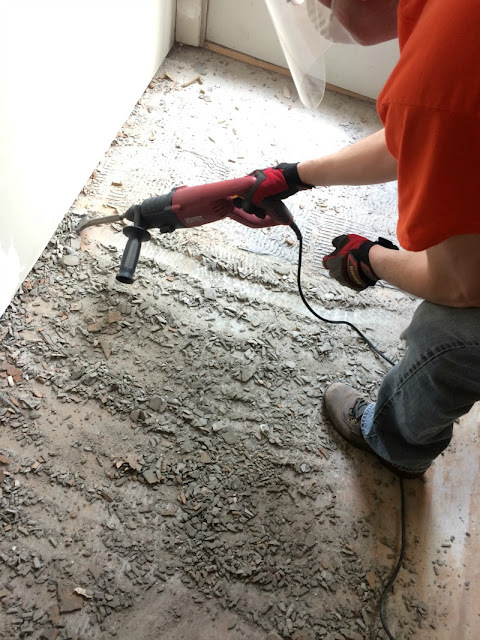 When we began the basement reno, we ripped out a tiny bathroom in order to create a mudroom area off the basement entrance. 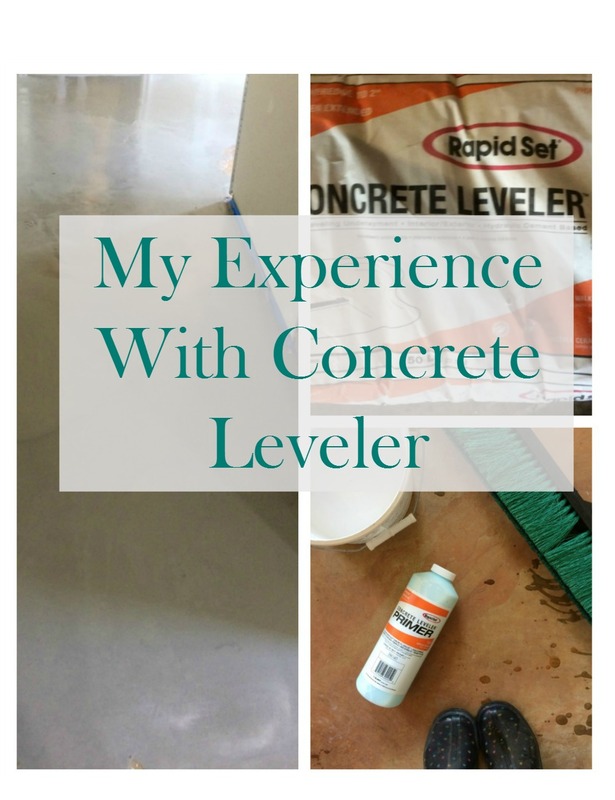 We were left with a narrow walkway of tile at the entrance that continued into the hallway. 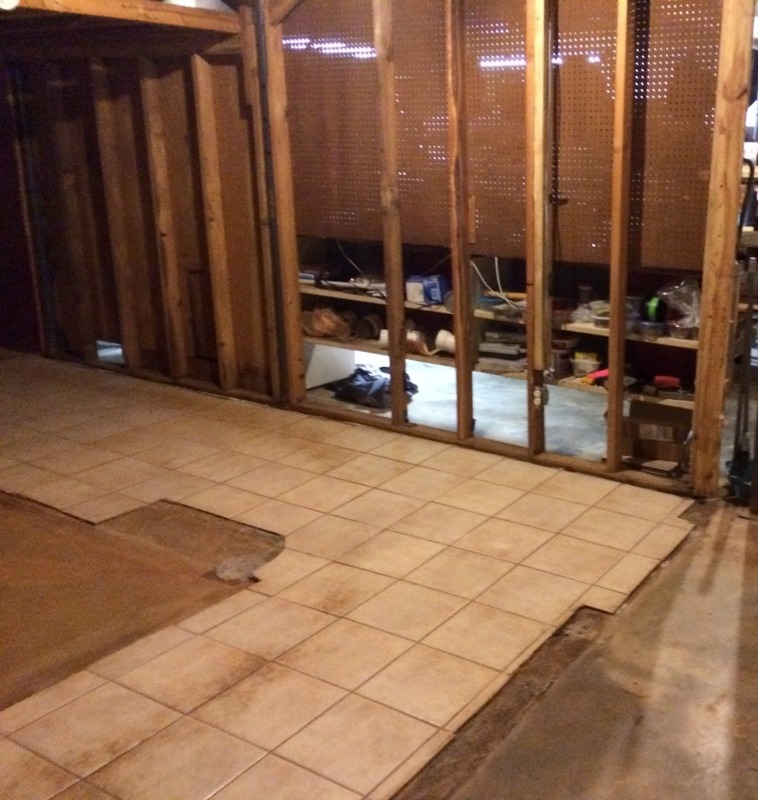 The plan was to remove the tile, level the floor, (since there used to be a drain in the middle and the floor sloped) and install vinyl planks throughout the space. 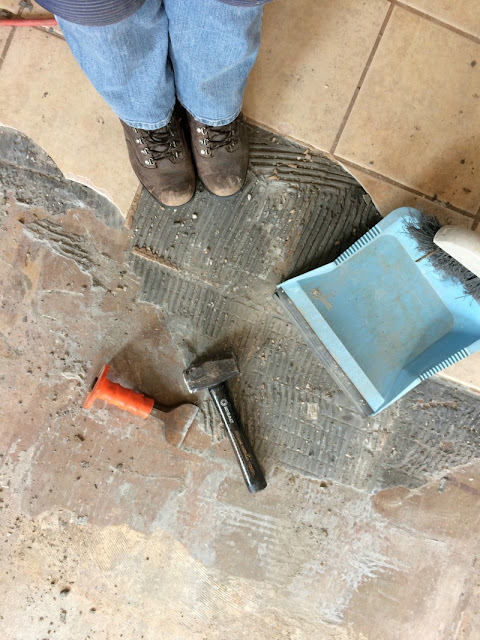 Before you start tearing out the tile, make sure to don your safety gear. We wore safety goggles, dust masks, and work gloves. The tile is sharp and chips fly when using the hammer drill. It also makes an incredible amount of dust! 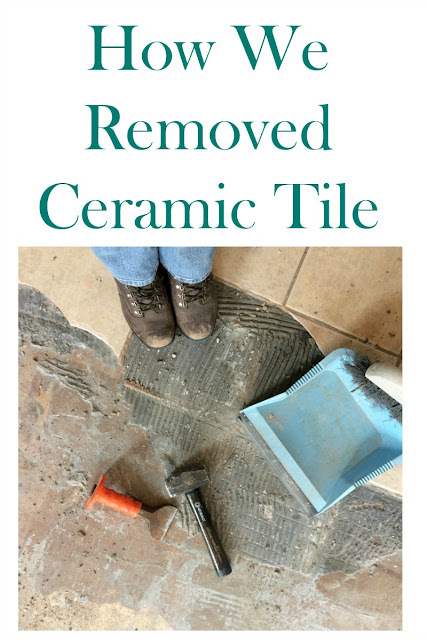 We only had one hammer drill, so we took turns using it to pop up the tile, while the other used a variety of implements such as chisel and a crowbar. We tried to remove the tile whole as much as possible, so we could stack it in the trailer. The thing about tile is the edges are sharp and the broken pieces would cut right through the contractor bags, so I ended up finding a couple of cardboard boxes to put the broken pieces in. After the tile was removed, we then had to remove the grout...or in some places concrete. It was so taxing that we could only work for a couple hours at a time before our arms got worn out. It took us a couple of weekends, working on it off and on to remove all the tile and grout, getting it smooth enough to apply the leveler. I will have to say out of all the projects we have completed in the basement over the last two years, this was the hardest. This is why we decided to paint the tile in the other half of the basement, rather than remove it. 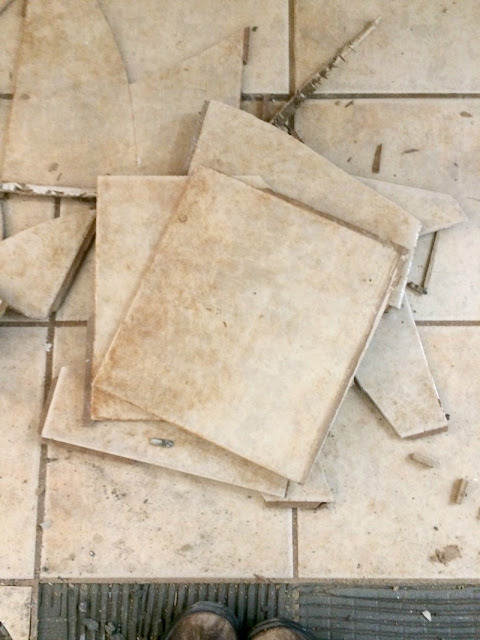 Have you ever tore up tile? If so, let me know your best tips in the comments. This is something that I hope that I never have to do. It is quite hard!